That green looks really nice as a background, Congratulations on a 2016 finish too. I call it ‘hospital scrub green’, but I actually really like it in this quilt! It’s a wonderfully easy quilt top to put together – it’s become my default when I want something easy, but striking to piece. Makes great baby quilts! So do I! I’ve been waiting forever to get this one quilted, and am excited to get it washed so I can sleep with it on my bed. I was surprised at how well this quilt top worked, but I probably shouldn’t have been. Scraps usually manage to shine. Love your quilt. I like scrappy quilts and the colors just ‘pop’ here. Thanks for sharing. 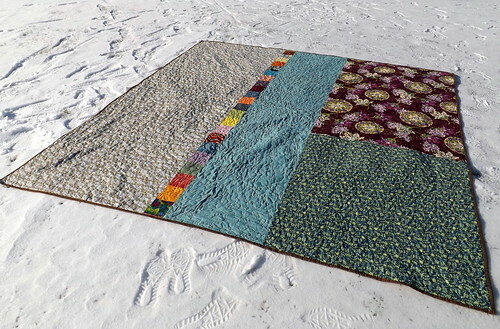 I started out as a scrappy quilter, so scrappy quilts are like ‘home’ to me. I love working from my scraps! Nothing to be embarrassed about! I have UFOs that never even reached top completion hiding in my stash. Once upon a time, I was more of a finisher, and then I discovered the online quilting community and endless inspiration. I think most of us do! 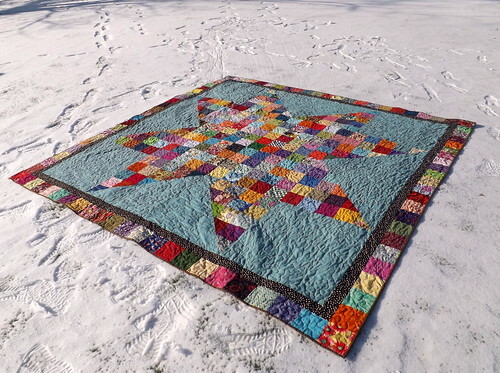 I’m amazed at quilter’s who manage to stick to a single project until it’s completed. I don’t have that kind of discipline and strength of will! Thank you! I’m so glad to have gotten off to an early start in wrapping up projects this year! I love this quilt!!! Mind is already churning on how I’m going to use it for inspiration. And just to make you feel better – I recently cleaned up my sewing area and found at least 1 project I don’t remember buying or creating – though I know I did. It was a bag and just needed the straps sewn on. Finished it up this weekend!